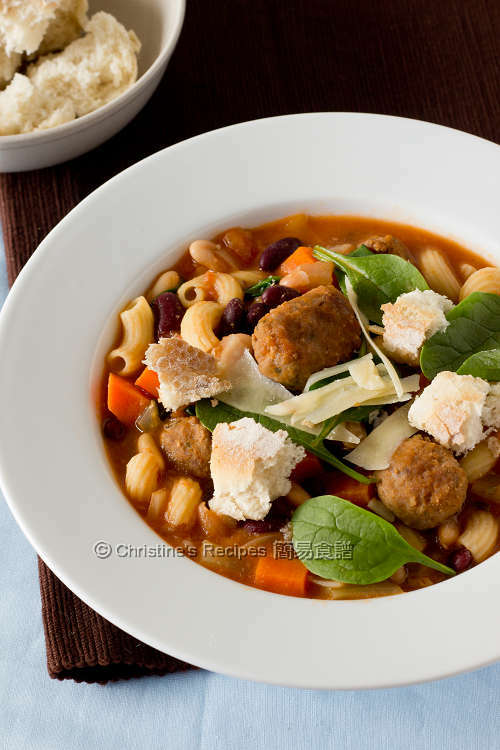 This Italian Meatball Minestrone Soup is one of my all-time favourite autumn or winter dishes. This one-pot soup dish is packed with flavours and easy to whip up on the go. You can’t go wrong with this no-brainer recipe. 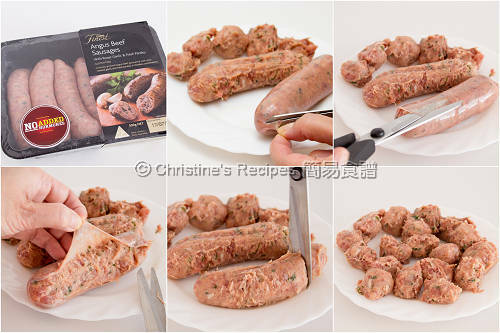 I didn’t make my own meat balls from scratch, simply get some Angus beef sausages from the supermarket. It saved me a lot of time and energy. The beef sausages meat, full of flavours, went really well with all the vegetables I put into the pot. Believe it or not, this soup can be made within 30 minutes. These are the organic red kidney beans and organic cannellini beans I used. They are full of nutrients your body needs. The soup texture is also enriched as well. Simply drain the water out, then put the beans in the soup. How wonderful it’d be when you’re served with a bowl of hot soup. It helps beat away the chilling weather. Oh well, if the weather is warm up again, this soup is also fantastic. Simply turn myself into a not-in-a-hurry mode, patiently wait for a little while. 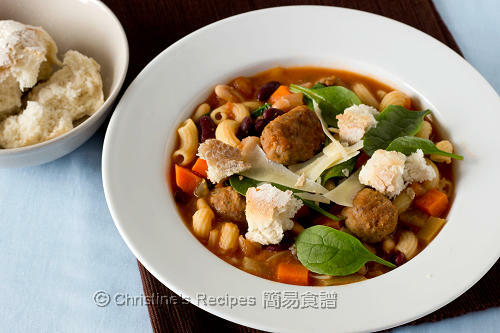 After it cools a bit, I can immediately dig in and enjoy this flavoursome minestrone soup. A side note, if you’re going for vegan meals, simply skip the beef and use vegetable stock. You’re good to go then. 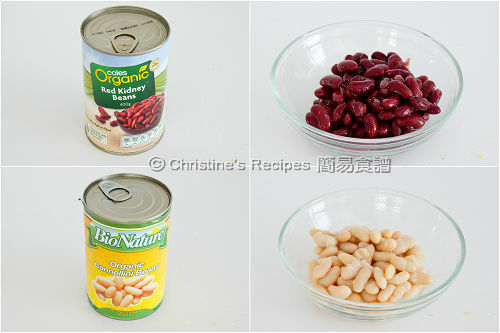 Drain out the red kidney beans and cannellini beans. Discard the water inside. Set aside. Heat oil in a large pot over medium-high heat. Add beef sausage chunks. Cook until all sides are lightly brown. Remove from the pot and place on kitchen towels to absorb excess oil. Discard excess oil from the pot, leaving about 2 tablespoon of oil to sauté vegetables. Add onion and cook until soft. Make sure not to burn them. Add garlic, celery and carrot. Stir to combine. Continue to cook about 2 minutes. Pour in diced tomatoes, chicken stock and water. Bring it to a boil. Continue to cook for 3 to 5 minutes. Add red kidney beans, cannellini beans, beef sausages. When it boils again, add macaroni. Cook until the macaroni is just al dente, less 1 minute than the time suggested on packaging. Don’t over-cook it. Turn off the heat. Stir in baby spinach. It’s done. In the meantime, heat up sourdough buns in a preheated oven or pan-fry in a non-stick pan. Sprinkle shredded parmesan cheese on top when served. Hot sourdough buns served as side. Enjoy! For convenience, you don’t need to cook macaroni separately or blanch them in boiling water. By doing this, you’ll get the most nutrients from it. Sourdough bread, available at supermarkets, is often served with western soups. Its crust is crispy and inside soft. You may use garlic bread or any other bread if you like. Delicious! It's one of my favourites too.